Prescott is rich in history, housing one of the most famous red-light district areas known as “Whiskey Row”. This area on Montezuma Street had many saloons, with the most famous being the Palace Saloon. 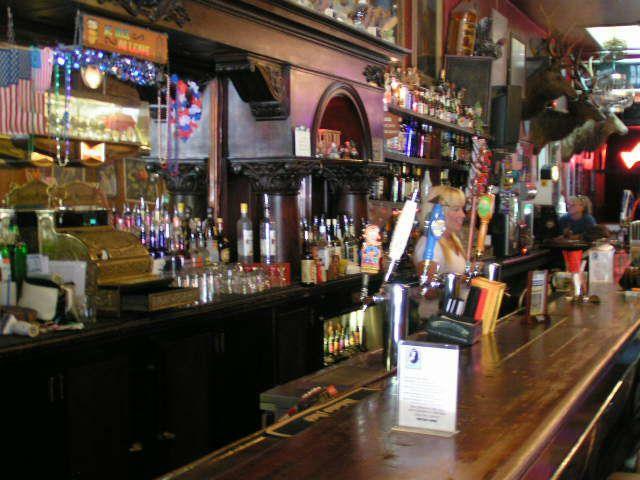 The Palace Saloon opened in September of 1877 and was filled with the highest standard of liqueur and decorated with the most impressive furniture from all over the world. The Palace wasn’t just a place to get a meal or have a drink, many men would check out the postings for work, bought and sold mineral claims, and it also served as a place for elections. It can boast having many notorious figures from history frequenting the place such as The Earps, Doc Holliday and “Big Nose Kate” Elder in the late 1870’s. Virgil and his wife Allie lived in the Thumb Buttes area of Prescott and owned a saw mill before joining his brothers in Tombstone. There are stories that Doc Holliday won 10,000 in poker at the Palace and afterwards joined the Earps in Tombstone eight months later. In 1883, a fire destroyed most of Whiskey Row, taking out many buildings including the original Palace Saloon. Robert Brow, the Palace owner, rebuilt the place with a stone foundation and brick walls. Not only was it built sturdier, but he made it even grander than before. He added and elaborately carved 1880’s Brunswick bar measuring approximately 20 feet long. Unfortunately, Prescott suffered another huge fire destroying most of down town and again abolishing the Palace Saloon. Most of the patrons grabbed their drinks and much of the liquor stock and went across the street to watch the Palace burn. Some of the more faithful of customers actually lifted the Brunswick bar and carried it out to safety. That bar is still remains in use and is the only historical thing left and can be seen in the Palace today which was rebuilt in 1901. 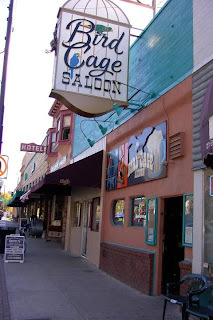 Another historic place along Whiskey Row is the Bird Cage Saloon. It was established in 1967 and was named for the large assortment of mounted birds displayed in cases located all over the bar. This group is a small percentage of the total Stamm bird collection. More can be found shown in cases at the Smithsonian Institute in Washington, D.C. Sadly, two nights ago on May 8, 2012, the Bird Cage Saloon caught fire and burned down along with the two businesses attached to either side of the establishment. Because of the firewalls, the other businesses were saved. 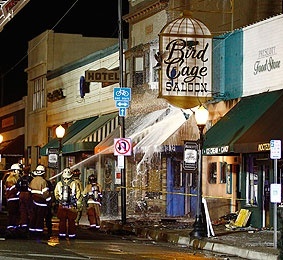 The Bird Cage Saloon was completely destroyed. I was so sad and cried when I heard the devastating news. I live there from 1988-2007. I heard so many wonderful stories and met wonderful people. They will rebuild the Bird Cage and I will support them all I can. I been there only twice so I don't have the great memories that you experienced. I hope they rebuild the place as well. I read somewhere that they saved the sign. How sad that so much history can literally go up in smoke. I know, it is sad, and it wasn't the first time Whiskey Row went up in smoke. That is really a fun nightlife in AZ. It takes on a whole different feel at night from the pleasant Mayberry feel in the daytime. At night, it's the sound of honky tonk music, glowing lights, people on the sidewalks. I feel like I'm part of a cool happening.